The soup was on in downtown Bremerton this weekend, and in a big way. 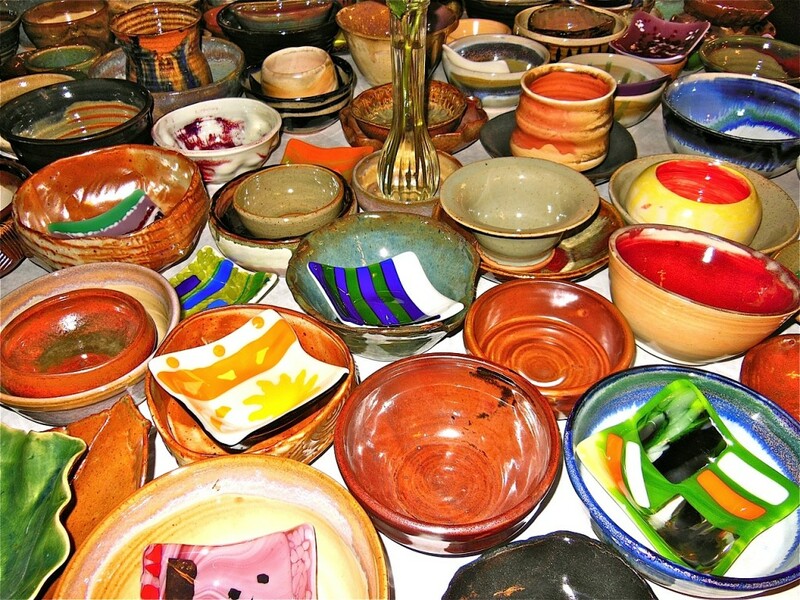 The Bremerton Foodline’s Sixth annual “Empty Bowl,” featuring colorful handmade bowls that could be filled up with hearty soups, raised $17,500 to go toward its mission. Nearly 400 people attended or volunteered. The Olympic College Clay Club made more than 500 handcrafted bowls for the event, and numerous others created soup bowls (including 60 glass bowls from downtown glassblower Mistarian Roses and, for the first time, wooden bowls donated by the Wood Turners Group). One artist alone, Charles (Chaz) Martin, made over 180 bowls, and one bowl was even autographed by musician Carrie Underwood. The event has grown so quickly that Mayor Patty Lent said Monday she is personally paying for a bigger space next year at Olympic College. The Bremerton Foodline’s 6th annual Empty Bowl presented by Rice Fergus Miller and Windermere Real Estate West Sound, Inc. was held on Saturday, April 26th. The afternoon event was held at the Bremerton Eagles Aerie #192, an In-Kind Sponsor, and included gourmet soups from local chefs, handcrafted bowls from local artists, a silent auction, drawing for Artisan bowls and a 32″ Samsung TV, live entertainment and much more. Over 300 community members including Mayor Patty Lent, Bremerton City Council President Greg Wheeler, EmCee Bremerton Councilperson Dino Davis, Bremerton City Councilpersons Leslie Daugs, Jerry McDonald, Mike Sullivan & Roy Runyon, 75 volunteers, 13 Chefs and an estimated 200 artists raised over $17,500 for Bremerton Foodline food assistance programs for children, seniors, and other clients. The Foodline assists clients with emergency food monthly, available weekly commodities, available daily bread & produce, available clothing & household items and acts a resource to help connect other community services. The Empty Bowl 2014 would not have been possible without the generous sponsorship support of Rice Fergus Miller, Windermere Real Estate and In-Kind Sponsors The Resort at Port Ludlow, Bremerton Eagles Aerie #192, The Bremerton Patriot, and Fingers Duke. Contributions like theirs led the way to our most successful Empty Bowl to date. We would like to acknowledge the great local artists, businesses and organizations who provided the bowls that are the symbol of hunger in community. The Olympic College Clay Club created and donated over 500 handcrafted bowls. One artist, Charles (Chaz) Martin made over 180 of those and acted as a mentor at two of the Club’s Bowl-a-Thon’s this past year. Karen Mittet, President of the OC Clay Club donated over 30 of her bowls and as an Empty Bowl Committee member, was instrumental in amassing the bowl donations from around Kitsap. Mistarian Roses, LLC a glass studio on 4th Street in Downtown Bremerton donated over 60 glass bowls created by community members including 2 Drawing glass bowls by Mayor Patty Lent, Councilpersons Leslie Daugs, Jerry McDonald, & Dino Davis and Police Chief Strachan. Mistarian Roses, LLC artists taught these donors how to work with glass and offered the public a chance to create two bowls, one to keep and one to donate. They also, created a beautiful glass bowl for the Drawing. The Wood Turners Group including Collective Visions Gallery award-winning artist, Brad Stave, donated a variety of wood bowls and a set of nested bowls for the drawing. The wood bowls were a popular addition this year. Local renowned artists Lisa Stirrett, Marie Weichman and Al Tenant donated their amazing pieces along with artists from across the Sound including Sam Scott of Shoreline and Charan Sachar (in BIMA) of Federal Way. One bowl created a lot of attention was designed and created by OC Clay Club members, Sandy Landers and Marie Weichman, with an autograph signed specifically for Empty Bowl 2014 by singer Carrie Underwood. We would also like to recognize the kitchen and service help by these friends: Cynthia Jeffries and Chef Richard Kost of CJ’s Evergreen General Store & Catering who oversaw the heating of and serving of the soups donated by local chefs. Chef Drew Borus of Vancouver, BC has volunteered since 2011 with Chef Richard and drove down to join us again this year in the kitchen. OC Culinary students volunteered their skills to aid Chef Sam Schicker of La Fermata, Justin Robinson-Hyer of Toro Lounge and Bremerton Police Chief Strachan for the 215 person meal service. We are grateful to the 25 cadets from the WA State Youth Academy joined the Bremerton High School Key Club, Kitsap Princesses and others who served soup, bread, and water all afternoon. Our soup was provided through the generosity of local businesses including The Boat Shed, Der Blokken, Scout Hall & Honor Bar, Harrison Medical Center, Hi-Lo’s 15th Street Cafe, The Willows Assisted Living, Famous Dave’s, and Helen Jett. Chef Chris Plemmons and OC student staff created “Smoked Salmon Chowder” and “Spring Pea” soups to join cooks from Hallowed Grounds Cafe at the Silverdale United Methodist Church who donated their Corn Chowder. Musical entertainment for the event upstairs was provided by Greg Hanenburg of Moxie Swing accompanied by singers from the Bremerton Community Theater and one 9-year old, Erin, from the audience. Musicians entertaining in the Soup-To-Go section included Bremerton High School student Dalton on guitar and Aaron McFadden on guitar.